TIP: Op de website van Computeridee vonden we een gratis programma met recepten voor de bierbrouwers onder ons. Hieronder de Engelse tekst van de website. Brewtarget is FREE brewing software, and an open source beer recipe creation tool available for Linux, Mac, and Windows. It automatically calculates color, bitterness, and other parameters for you while you drag and drop ingredients into the recipe. 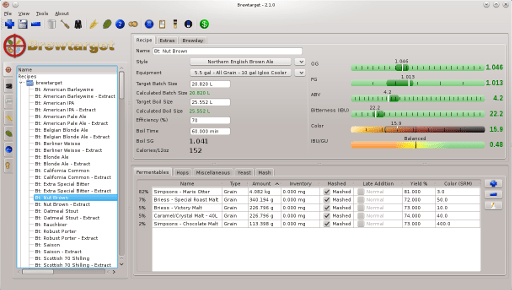 Brewtarget also has many other tools such as priming sugar calculators, OG correction help, and a unique mash designing tool. It also can export and import recipes in BeerXML, allowing you to easily share recipes with friends who use BeerSmith or other programs. All of this means that Brewtarget is your single, free, go-to tool when crafting your beer recipes. Het programma is grotendeel vertaald naar o.a. het Nederlands en is HIER te downloaden. Er is een versie van Brewtarget beschikbaar voor de meest gangbare besturingssystemen zoals: Windows, Linux, MacOS.